Artist Zdzislaw Beksiński is best known for his immense, obsessively detailed paintings of catastrophic landscapes, surreal humanoid figures and afflicted nudes. Born in 1929, he grew up in southern Poland, then traveled to Krakow to study architecture where he subsequently spent several miserable years working as a construction site supervisor. His work from that era is primarily photography and sculpture. 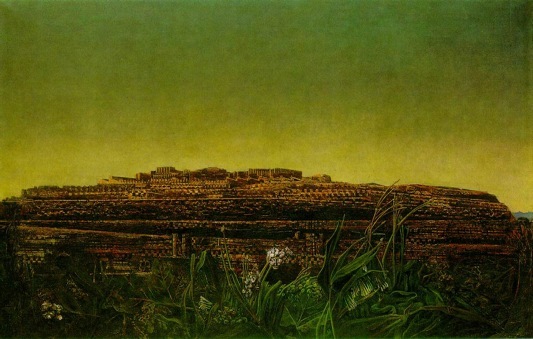 In his mid thirties, Beksiński shifted his focus to painting large, purely abstract pieces on wooden boards (he preferred wood to canvas). Eventually, their form and structure became more straightforward and he entered a self-proclaimed “fantastic period” reminiscent of Bruegel, Ernst or Bosch, and drawing comparisons to his Swiss contemporary, H.R. Giger. 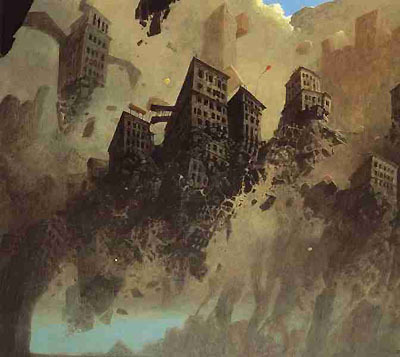 Beksiński’s post-apocalyptic vision, much like Giger’s, is uniquely disturbing owing in part to a highly developed architectural eye. His manipulation of scale and manic overworking of texture is ingenious. Overwhelmingly huge structures rise up from dust or empty desert. Sinewy figures cavort under ominous skies. 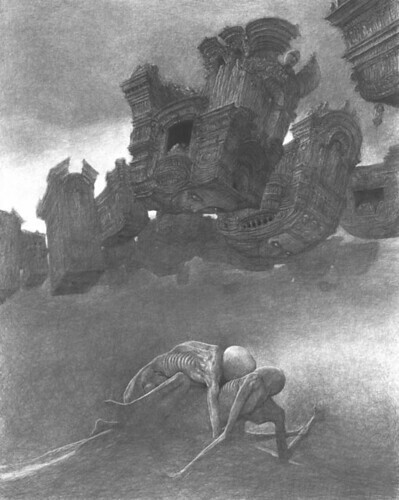 Although he depicts a harrowing world, Beksiński claimed that much of his work is misunderstood. Like Kafka (known to laugh hysterically when reading his own stories aloud), the Polish painter was often amused by his own work. He insisted his vision was ultimately optimistic. 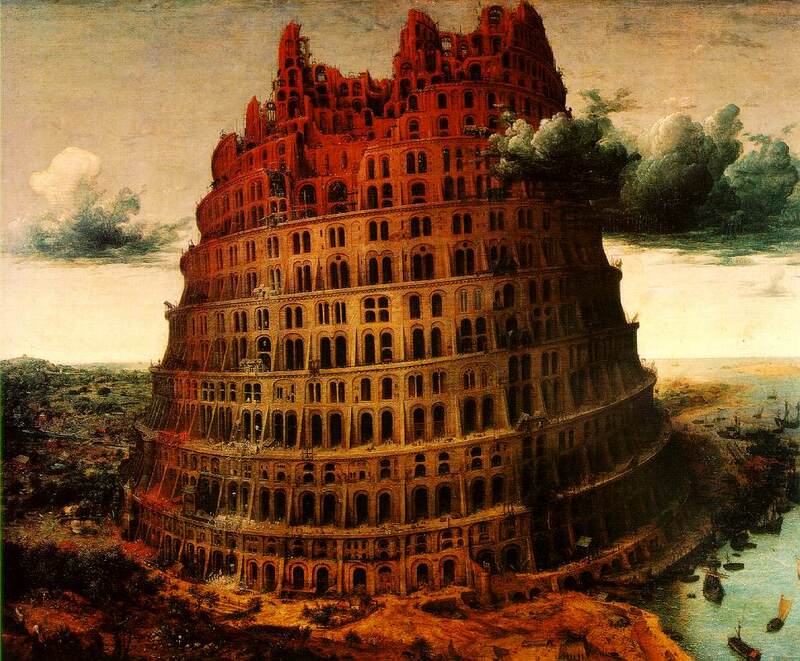 Beksiński claimed to abhor silence and listened continuously to classical music while he painted. He was soft-spoken but surprisingly gregarious, given his bleak body of work. In the late 90s, captivated by computer technology and the internet, he shifted his focus again, this time to digital art/photography. These pieces proved to be far less critically or commercially successful than his paintings. 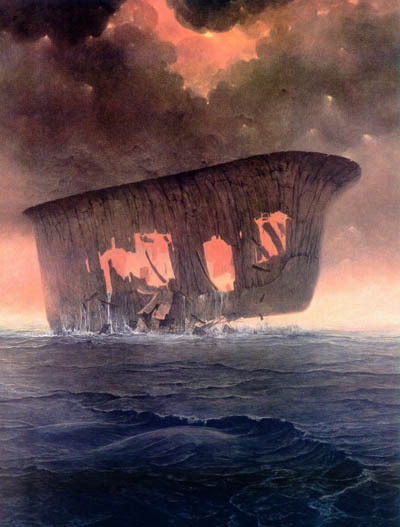 News of Beksiński’s own death in early 2005 was difficult to fathom. On February 21st, the artist’s body was discovered in his Warsaw flat, stabbed 17 times. Robert Kupiec (the teenage son of his caretaker) and a friend were soon arrested. Apparently Beksiński had refused a loan to the boy, prompting the attack. Kupiec pleaded guilty and is now serving 25 years in prison. His accomplice, Lukasz Kupiec, will be up for parole in a couple of years. * An interesting sidenote: Tomasz, like his father, loved music, especially The Legendary Pink Dots. 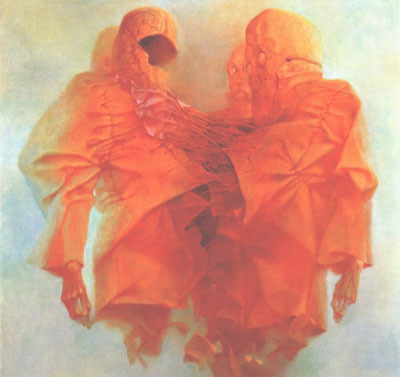 After his suicide, the band’s Polish reissues featured many of Beksinski’s digital art as covers, dedicated to Tomasz. I really really like these and was previously unaware of Beksiński and his art, thank you very much for rectifying that. He is a huge inspiration, thanks for this – I love him. Jawdroppingly beautiful work. 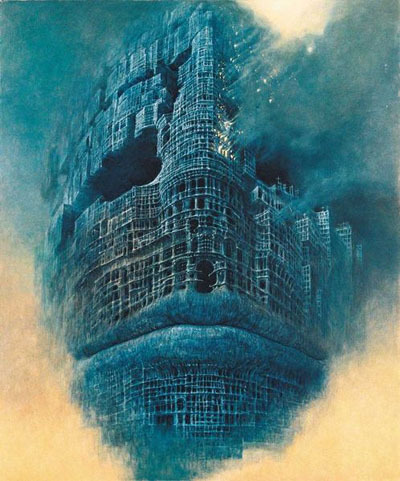 I can’t tell you how happy I am to see Beksinski put in the spotlight here. He was one of the first Polish artists I discovered when I moved to Poland (I remember wondering how I never knew about this guy before) and his work continues to amaze me. Thanks for writing about this amazing artist. I remember reading about his death, and finding his art (Specifically the trumpeter). I was immediately reminded of the stories of China Miéville, and Caitlín Kiernan… Just a wonderful resonance, there. Absolutely amazing work. Thank you, for posting this. Thanks, folks — can’t believe I’d never heard or seen his work. 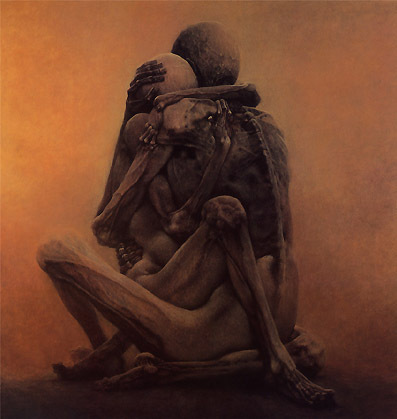 SO MUCH LOVE FOR BEKSINSKI. 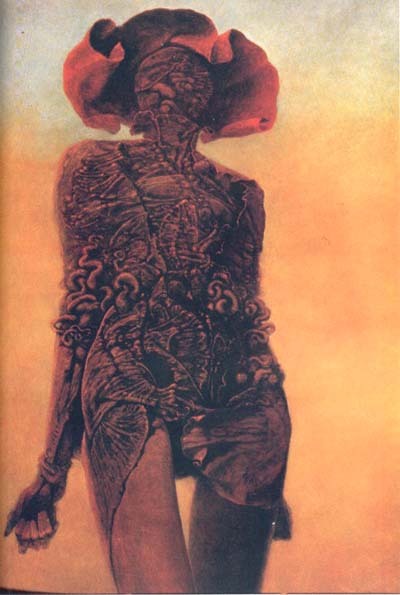 While the Beksinski art book is quite glossy and thorough, I’ve never seen any of his work in person and I’m dying to rectify that. Coilhouse caravan to Eastern Europe, anyone? sign me up! i’m gonna start packing now..
He’s absolutely one of my favorite artists, and a tremendous source of inspiration. I’m a little hard-pressed to think of anyone else whose images are as “immersive” as the ones he created. The news and circumstances of his death were a devasting shock. While in Switzerland, I recall coming across a weighty hardcover volume( or was it two? )of his art in a friend’s bookshelf. While deliriously feasting upon the riches within, I was somewhat dismayed at the fact that, aside from the book published by Morpheus, that his work wasn’t better known in the U.S. Thank you, thank you, for posting this, Mer! I’ve just returned from a sculpting job, with bits of clay still in my hair and beneath my fingernails. Xmas shopping in the wind and rain has clobbered me. Yayyy! Paul, I had a feeling you’d appreciate this post. :) Glad to hear you’re workin’ hard and getting your hands dirty. 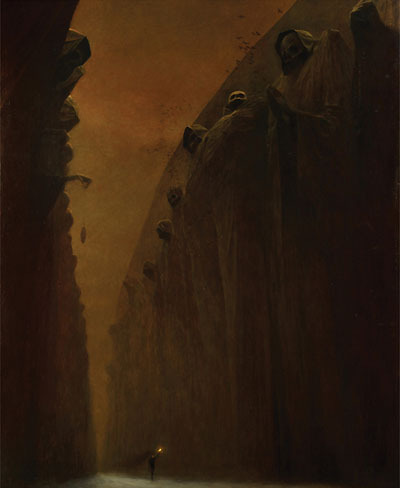 It is strange that Beksiński isn’t better known in the states. Publishers here eat up “similar” artists with a spoon. 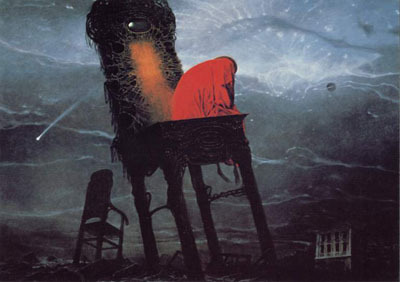 Maybe there’s something a little too organic and harrowing about Beksiński’s vision? For me, it’s a lot more emotionally resonant than just about anything else I’ve seen from that generation. 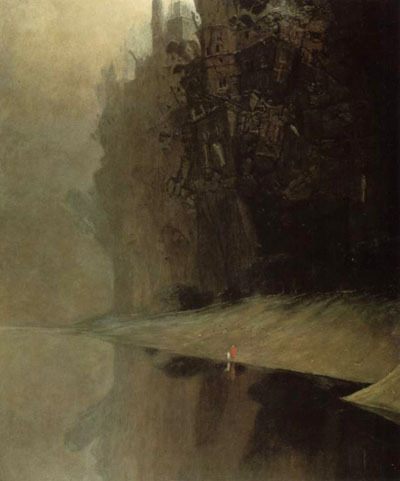 I discovered Beksiński via Paul! In Philly! This was before he died and I remember being floored, not only by the artwork, but by his amazing website. I look at it now and it might be a little over-the-top Flash for me, but when I first saw it, it was the most amazing thing I’d ever seen and it had a huge impact on my ideas about interactive design and what you can do. When we found out about his death a few months later, we were completely shocked. Thank you for posting this and reminding me of him! I can see the optimism… well let me say Romanticism in his work in the same way I see it in Caspar David Fredrich, even down to the tiny figures in his compositions. Its horrifying because it has that same sense of the Sublime. Its the same thing that frightens me about the vastness of the ocean or the majesty of the grand canyon. He always reminds me how tiny we are in the vast scheme of things, how the world could roll over and crush us and never know the difference. Great artist, one of the first I discovered through internet, certainly helped me to understand the beauty of nightmares. On the subject of nightmarish apocalyptic visions from Poland, I discovered through a friend on myspace the powerful work of the artist Arek Baginski. here’ s a video of him, with music from the equally good music project Job Karma. Aiiyeee!That music was, ehmm… not subtle. But I can’t imagine anything more awesome to be listening to at top volume at three AM on the birth of Lord Jebus. Your friend Baginski’s work is certainly nightmarish, apocalyptic and heebie jeebie-inducing. Is it something in the drinking water over there?! Thank you for sharing, Eta. It’s just all sorts of beautiful…oddly comforting for me. Then again I’m the type that’s really creeped out by Thomas Kinkade paintings. The characters in this image look like they’re wearing Mother of London. Tequila, I also recoil from Thomas Kinkade’s awful stuff. Almost as violently as I do from Anne Geddes’. But not quite. Spooky but pretty damn awesome. Kind of reminds me of old dimestore SciFi novels that used to come out by the handfuls. All those Fantasy/D&D images. I like them, I just don’t see much in them that are totally inspired or original. Lots of artists have used this kind of vision, some are more successful than others but they all seem to be kind of sparked by the same influences. This is great because my father new him back in art school they worked together, my fathers style is not the same but theme is similar. For those who are interested how artists influence each other might be interested in visiting http://www.dikarevart.com in order compare two artist that grew up and aged perfecting their art. At first I was taking these drawings rather lightly and was ready to post up a comment about a movie all this resembled to me. Anyway, after reading the article I was rather impressed in a completely new direction. And that last drawing I imagine it’s kinda the scene of founding his son and forever stayed with him. Hence he’s never being the same afterwards. One word – spooky. When mixing up a life’s this tragic story with these drawings. I can definitely see the connection to this art and the backgrounds of the Silent Hill video game series, particularly SH 2 / 3. One would not be surprised to find out that one of those structures was the residence of one Pyramid Head. how did i manage to slog through life all these years without knowing about this artist? thank you so much for sharing. wow. this kind of work messes one up, doesn’t it…? It’s strange tho, this must be a polish thing…since there are a few grafic artists and painters..with this same sort of vibe. Wieslaw walkuski is the most famous one for his posters and prints…and if you look at it.. you see the link. anyways.. Much appreciation for all of them. 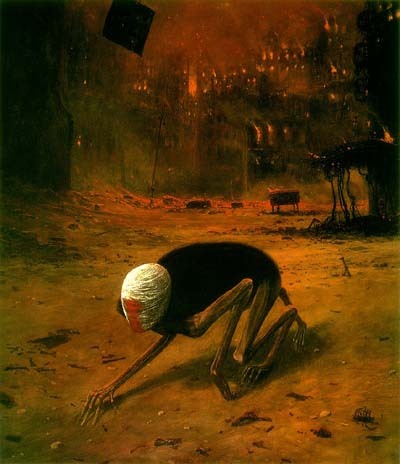 Beksinski was a genius and one of my biggest artistic influences. It is a wonderful thing that you are helping to expose his work to the world. As well known as he is in underground culture, he is still vastly underrated and largely unknown in mainstream culture. Wow, hi, Chet! Thanks for reading. We need to do a feature on your work at some point soon. 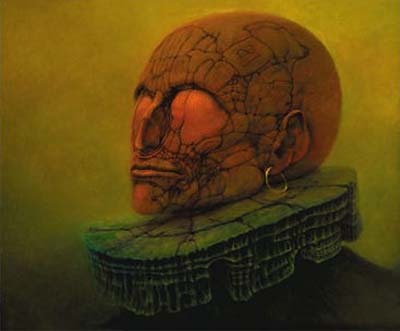 It is strange, how relatively obscure Beksinski’s work remains. He really was a genius, and has inspired so many of us in various ways. Incredible paintings. I think Zdzislaw Beksiński is now my favourite artist, upon which I discovered by accident this minute, also viewing more original works on his website. They truely emit the strangest atmosphere thats hard to describe, like from a true fantasy nightmare. 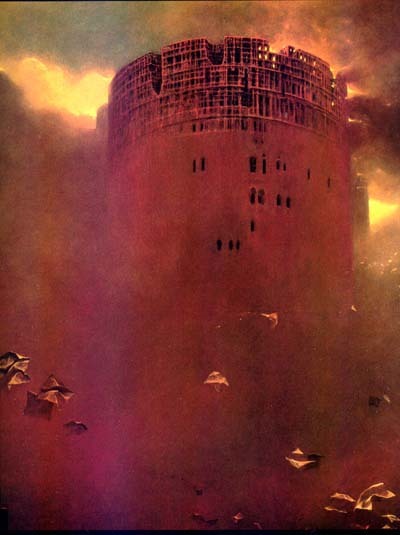 My only wish would to be as visual with my ideas and thoughts as Beksiński.Sad to hear he was murdered. Haunting but gorgeous. Thanks for the post! Does anyone know where i can purchase prints of any of his work? Oh, it’s nice to see and hear all this big thing about polish, great artist. Check another one: Franciszek Starowieyski. His specialisation was poster but other creations were also great! reminds me of wayne d. barlowe as well. Can’t seem to find much on him during the war time… Must have been pretty young, but to be in Poland during that time must have been scary… I feel like that could have influenced his work. Wow, thats sad at the end. What great pictures he made. Short Film I made using animation and Zdzislaw’s Work. Zdzislaw is an amazing artist. HIS OIL PAINTINGS ARE incredible!! 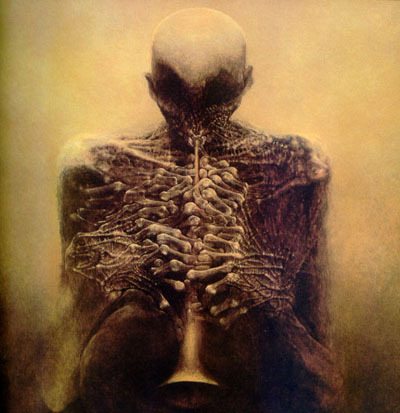 Thank you, Zdzislow Beksinski`s Spirit for your Art ! You are one of the gratest Artists of 20 th. century. Thank you, Mother Poland.